Thanks to everyone that entered. I'm sorry that it took me so long to post the winner. Last week was my birthday and I spent most of the week partying and doing research. The story of a great queen, a woman of enormous courage who made her own rules, and a true survivour. This is the first in a series of early medieval novels by Vanora Bennett, the author of 'Portrait of an Unknown Woman' . Catherine de Valois, daughter of the French king is born in troubled times. Though she is being brought up in a royal court, it is a stormy and unstable environment. Her only firend is the remarkable poet and writer Christine de Pizan. She is married off to Heny V as part of a treaty honouring his victory over France, and is destined to be a trophy wife. Terrified at the idea of being married to a man who is at once, a foreigner, an enemy and a rough soldier, Catherine nevertheless does her duty. Within tow years she is widowed, and mother of the future King of England and France - even though her brother has already claimed the French crown for himself. Caught between warring factions and under threat the powerful lords of the English court and her own brothers-in-law, she has to find her own way, if only for the sake of her baby son.She takes strength from the teachings of her mentor de Pizan, and the possibility that she will be able to return home to France. She is also supported by Owain Tudor, controller of her household-a dangerous support as rumours of their relationship would jeoperdise her right to keep her child. To save her son, and herself, She must turn away from her love and all that is familiar and safe to find another way forward. Vanora Bennett is a journalist and writer. She lived and worked in Russia for 7 years, writing for Reuters and the LA Times. She has been a foreign correspondent and feature writer and contributed to publications including The Times, the LA Times, the Guardian, the Observer and the Evening Standard. She lives in London with her husband and two sons. She has written two previous novels: Portrait of an Unknown Woman and Queen of Silks. 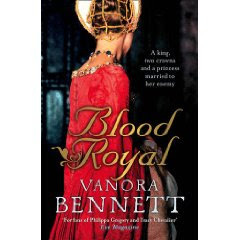 Her latest novel, Blood Royal came out in the UK in May 2009. It will be published in the US sometime in 2010. Note this giveaway is only available to my American and Canadian readers. 4) The contest ends November 18th 2009 at 12:00 p.m. and will be announced on November 19th. Please include me in the drawing for the Bennett novel. I just became a follower, too! Ahhh! Left it on the previous post, so I'll leave it again. And because I was selfishly absorbed in the giveaway, I forgot the important thing: Happy late birthday! I'd love to win this one, thank you. Please put me in the running! I enjoyed Portrait of an Unknown Woman, and I'm sure this novel will be a great one too. Thanks for the giveaway. Sounds like a great read! I am a follower thru bloglines. Please enter me in this fantastic giveaway.